the Fenwick section of Old Saybrook, Conn. She was 96 and also had a home in Manhattan. and her boyish figure always in the trousers that she helped to make fashionable. until the end of his life. 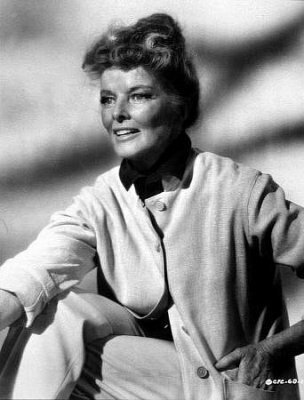 He and Miss Hepburn lived together for 27 years, until his death in 1967, and made nine films together. bring her down a peg; she never minds. 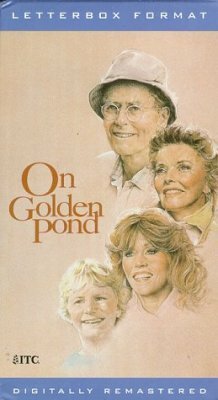 became especially poignant when they played a married couple in their last movie together, "Guess Who's Coming to Dinner." Tracy died just 17 days after they had finished filming it. 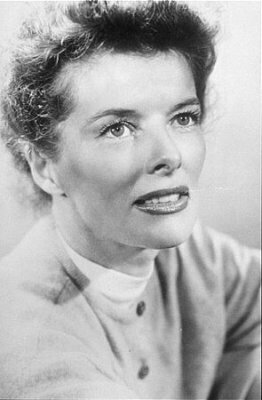 Hepburn felt free to discuss the love affair. In later years she spoke openly about her life and career, especially in her 1991 autobiography, "Me: Stories of My Life" (Alfred A.
seller, a tribute to her enduring appeal across generational lines. had given her birthday as Nov. 8. That was the birthday of her older brother, Tom, who died at 16.
open the possibility that he had been practicing a magic trick. little girl that she cut her hair and called herself Jimmy. "I thought being a girl was really the bunk,"
she said in an interview. "But there's no bunk about Jimmy." 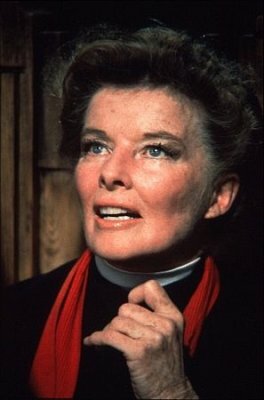 After graduating from Bryn Mawr College in 1928, she had small parts in stock theater companies. which she entered by descending a narrow staircase, carrying a stag over her shoulder. moved by the test, although the performance wasn't that good. But I thought, `That girl is rather interesting.' "
aspiring actress who learns a tough lesson about survival, in the 1933 film "Morning Glory," only her third movie. Meryl Streep received her 13th this year. 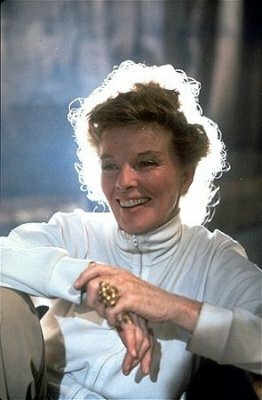 Miss Hepburn won three more, for "Guess Who's Coming to Dinner,"
"The Lion in Winter" and "On Golden Pond," but never showed up to collect any of them. family home on the Connecticut River, to which she returned often). Luddy, absolute pig." She continued: "He was an angel. I thought of myself first, and that's a pig, isn't it?" For her interpretation in the film and for her exceptional achievements in cinema. although I don't quite understand why. 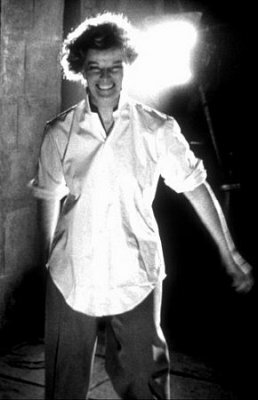 Of course, I have an angular face, an angular body and, I suppose, an angular personality, which jabs into people." Designers of America gave her a lifetime achievement award in 1986.
decline. In 1938 she appeared on a list of actors labeled "box-office poison" in a poll of movie exhibitors. former husband, James Stewart as the reporter, and a hit movie. She never lost control of her career again. Tracy, whom she had never met, to play the sportswriter. This time she got him. followed a similar pattern. 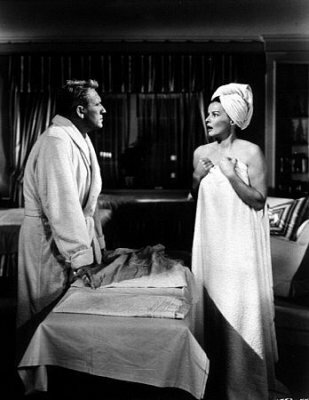 In "Adam's Rib" (1949), they are married, opposing lawyers, both nicknamed Pinky. In "Pat and Mike"
(1952), she is a champion athlete, and he is her rough-hewn manager, with whom she falls in love. figure, "Not much meat on her, but what's there is `cherce.' 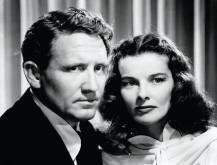 "
dramas "Keeper of the Flame" (1942) and "State of the Union" (1948). 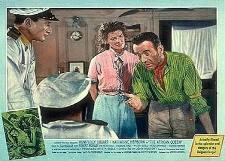 opposite Humphrey Bogart for the director John Huston. of the African Queen: Or, How I Went to Africa With Bogart, Bacall and Huston and Almost Lost My Mind" (Knopf). aging, dismissed queen, but none of the actress's contemporary mannerisms. easily as they had in her youth. and modern as she had ever been, even venturing an unprintable line about ducks. appeared in several Shakespeare plays in Stratford, Conn. And in 1969, when she was 62, she made her singing debut on Broadway in the Alan Jay Lerner musical "Coco,"
based on the life of the fashion designer Coco Chanel. She also appeared on Broadway in 1976 in "A Matter of Gravity," by Enid Bagnold, and in 1981 in "The West Side Waltz,"
has learned to do is breathe unchallengeable life into lifeless lines." both directed by Cukor. And in later years she kept busy with minor television movies. 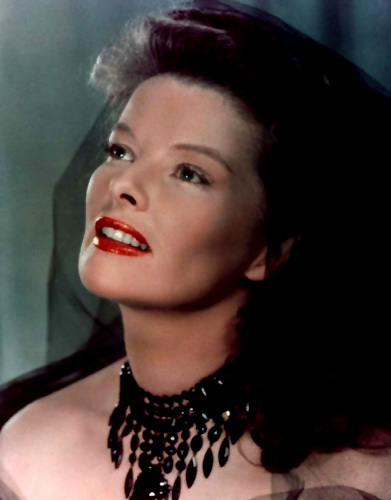 She played a fictional version of the typically feisty Kate Hepburn character in "Mrs.
Delafield Wants to Marry" (1986), "Laura Lansing Slept Here" (1988) and "The Man Upstairs" (1992). life exactly as I wanted. I wouldn't change a single thing. No regrets." As she aged, she had some physical problems from which she recovered well. She had hip-replacement surgery and operations on both her shoulders, but she remained spry. shaking head from her grandfather Hepburn. had to be to the end. "I have no fear of death," she said. "Must be wonderful, like a long sleep. But let's face it: it's how you live that really counts."